Two Year Anniversary: DC Style! It’s hard to believe that just two years ago we were getting married. 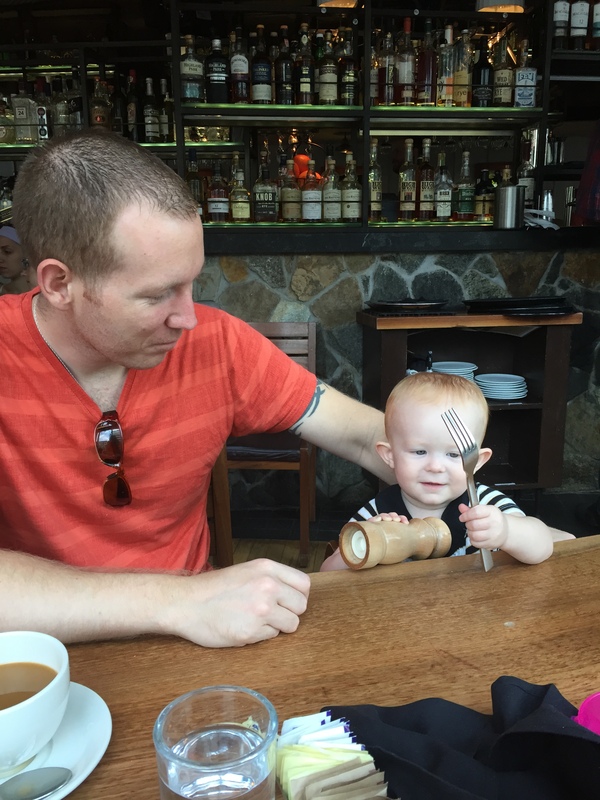 What a whirlwind it has been since then – two different houses and a whole new part of the state, and a fun little girl who is 15 months old! It definitely hasn’t been boring being married to my love. Brian planned a great evening out for us and my sweet friend offered to watch the baby. Dates nights have been few and far between now that we don’t live near family. I am so thankful for a great friend to watch my sweet girl. 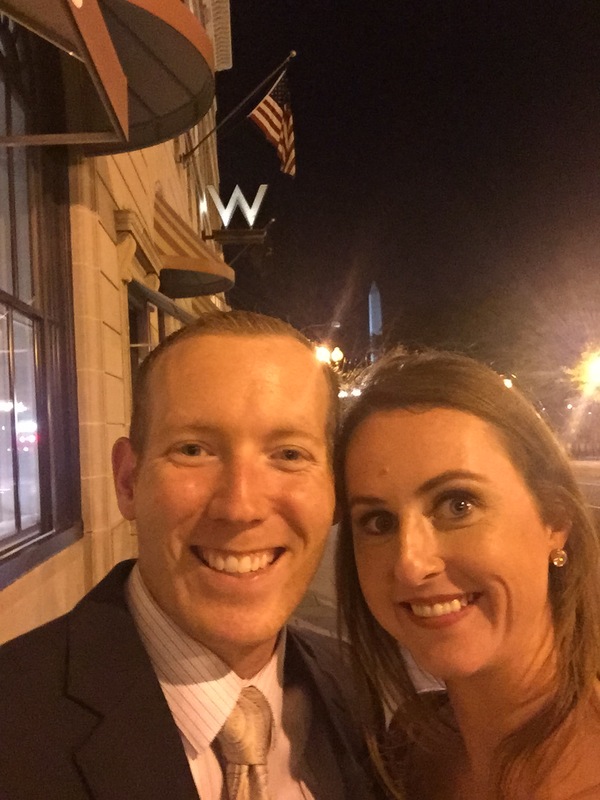 We checked into the W Hotel in DC (we stayed at the W in Boston on our honeymoon). I was debating on what to wear since we don’t get a lot of occasions to dress up. 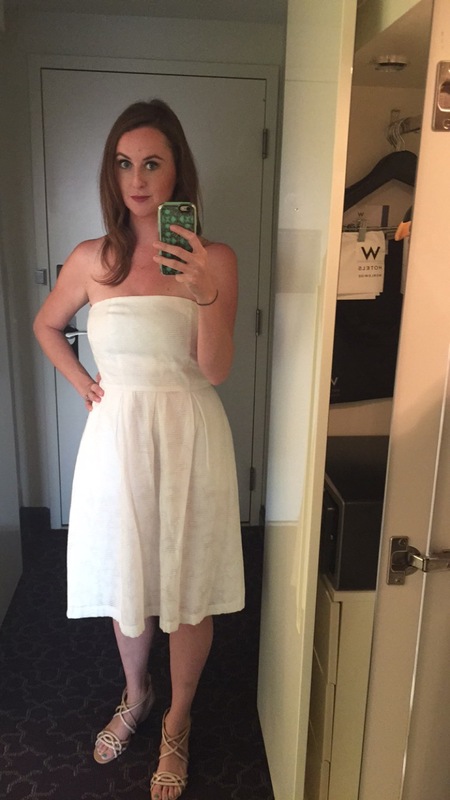 I tried a few options and then pulled out the dress we got married in. We had a pretty casual ceremony in downtown Roanoke. I thought it would be so fun to wear the same dress and I think it looked pretty great! We headed out to dinner then decided to take a little walk around before coming back to the W for drinks on the rooftop. It was such a great view of the White House and the Monuments. I don’t think I will ever stop being a tourist in DC, I get so giddy everytime we are in the city. Sadly all of my pictures from the roof are terrible iPhone shots, so I will spare you. After drinks, since we are old people, we headed out for dessert and coffee at Old Ebbitt Grill. 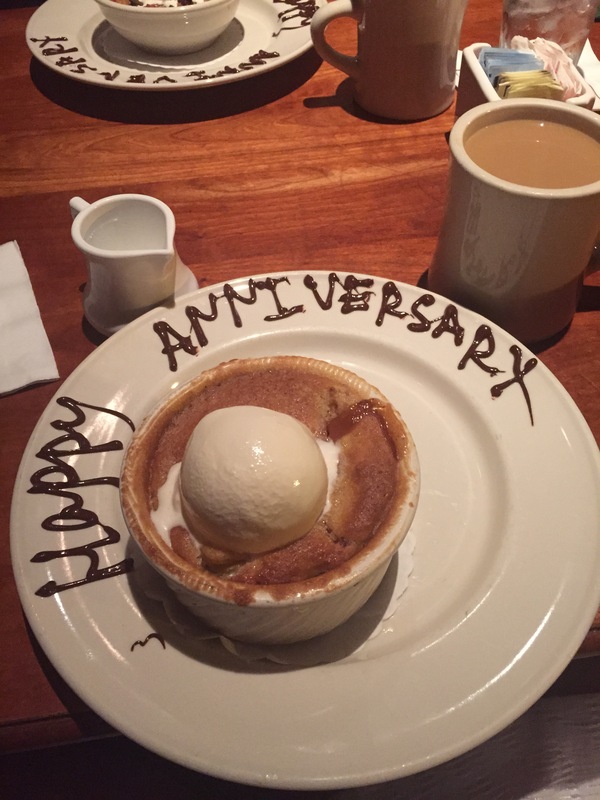 I was excited when they brought out my amazing peach cobbler with a personalized message on the plate. After that we drove out and picked up our little girl. She is a horrible sleeper and I didn’t want to subject anyone to her multiple wakeups in the middle of the night. 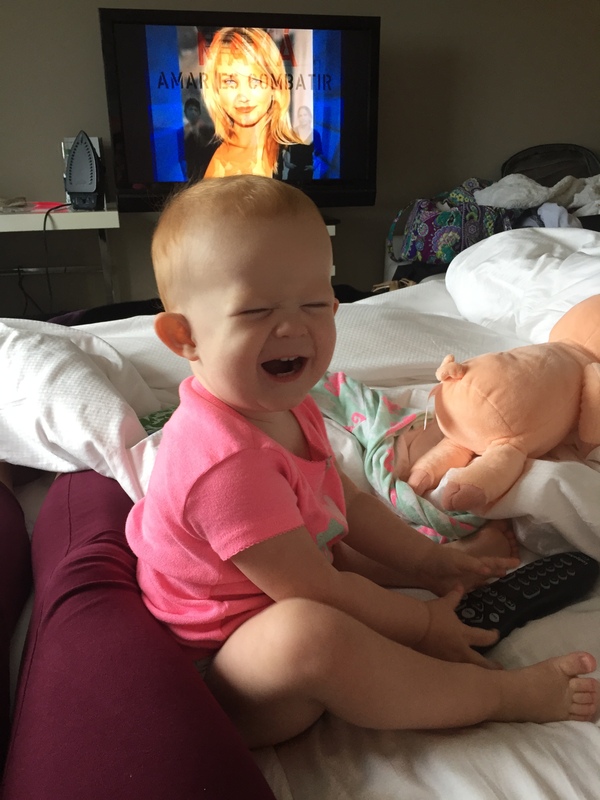 Clearly she thought it was really fun to be in the big bed at 1 in the morning! 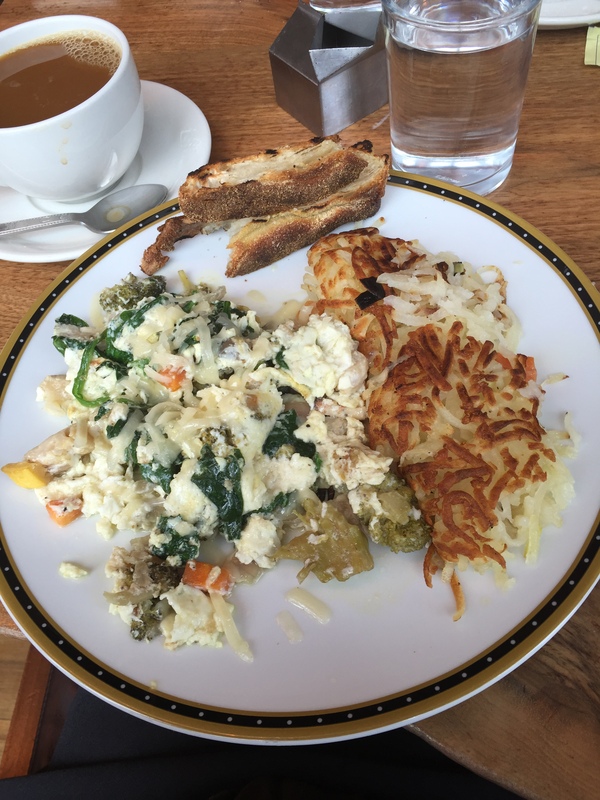 The next morning we had breakfast at Founding Farmers. It was seriously incredible. If you go I highly recommend adding a red velvet pancake to your order. Trust me, it did not disappoint. It was such a perfect weekend and I am so glad that Brian took time to plan it out and make it fun. 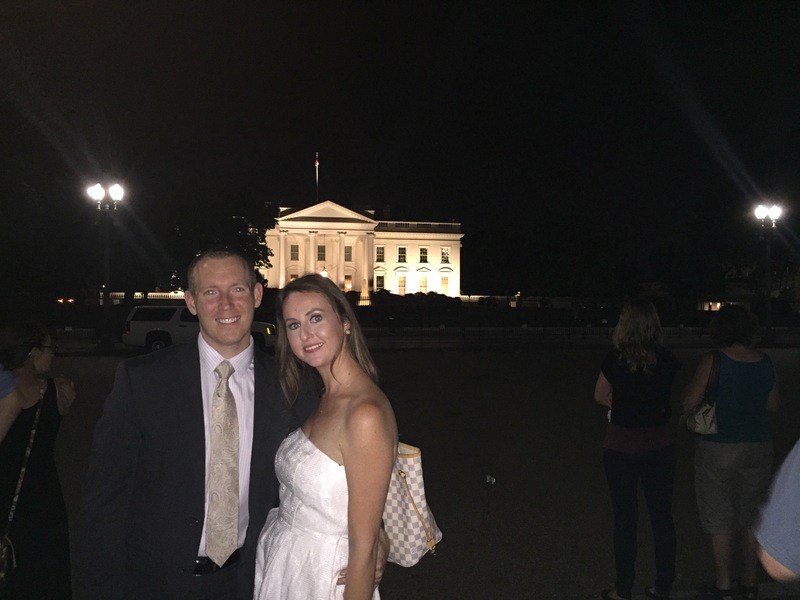 Date nights are definitely a necessity and it’s a bonus when you can do it in such a fun city! What was your favorite Anniversary and what did you do?